The poorest people often use health services less than their more affluent counterparts, even when those services are free of charge and widely available. One government project in Mexico has succeeded in redressing the balance. It's a hot summer's day in Huimilpan, a village in the state of Querétaro, a couple of hours north-west of Mexico City. About 100 people, mostly women, are gathered under a tree outside a community centre to listen to Dr Veronica Romero speak about birth complications, warning signs of postnatal infection and the importance of taking postpartum depression seriously. Her talk is illustrated with drawings of women in various stages of pregnancy and labour. This talk is one component of the Oportunidades programme, which is designed to improve the lives of the poorest people  who live on less than US$ 1 a day  at least a little, by providing health-care services, and nutrition and education incentives. It's one of the conditional cash transfer (CCT) programmes designed to break the cycle of poverty and improve the lives of poor people by offering incentives for families to invest in their children's development and health. About five million families, or 25 million people  one-quarter of Mexico's population  currently participate. Each family receives a monthly payment, free or low-priced medical services and scholarships in exchange for their participation in health, nutrition and education programmes. Other programmes like it have sprung up in Central and South America, such as Nicaragua's Red de Protección Social that targets poor rural households. Romero's health lecture contains information that many people learn at school in Europe and the United States of America, or hear from their doctors in private consultations. But most of these women have had little education or access to health services and are hearing the material for the first time, even though many are already balancing babies on their hips. At the monthly lectures, or platicas, participants receive basic information about healthy diets and tuberculosis as well as reproductive health, domestic violence and family planning. It's not just the information that's new, but also the idea of obtaining and using it. "They're not in the habit of taking responsibility for their health," says Romero, underlining one goal of the programme: to empower women and girls, by encouraging women to manage cash transfers received by the household and encouraging girls' education through scholarships. 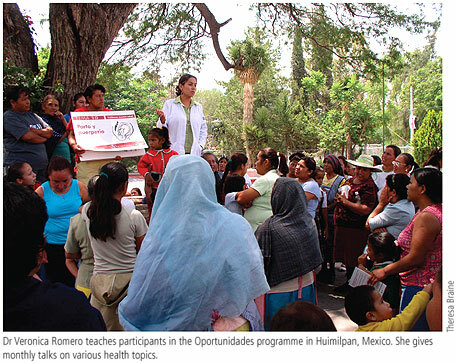 Public health is one of three components of Oportunidades along with nutrition and education. Based on a philosophy of "co-responsibility", the programme addresses the underlying causes of poverty by encouraging families to keep their children in school, ensuring they have adequate nutrition and benefit from health services. By focusing on women, the programme reaches those who tend to make decisions for the entire family on health, nutrition and education. A pregnant woman who attends the monthly lectures gets free baby-delivery services. One of the conditions for participating in the programme is that she must attend five antenatal consultations, two dental visits to check for pregnancy-related infection, and be fully vaccinated. Participants get free antenatal care if they show up within the first three months of pregnancy. Pregnant and lactating women and their children receive vitamins and nutritional supplements. The Oportunidades programme has reached 25 million people in 86 091 municipalities, most of them rural. The programme was originally launched in 1997 under the name Progresa, but its name was changed to Oportunidades after Vicente Fox took office in 2000 as president. Since then, it has expanded to include urban areas. Oportunidades has become the largest programme in the federal budget, having grown from 9 billion pesos (US$ 0.82 billion) in 2000 to 33 billion pesos (US$ 2.99 billion) in 2006, according to programme officials. It is partly funded by loans from the World Bank and the Inter-American Development Bank (IADB). Oportunidades officials say the programme recognizes the fact that poverty is not just caused by lack of income or human development, but is also characterized by the inability to escape the cycle of poverty and ill-health, and by the lack of a voice in society. What works when it comes to public health, says Rogelio Hermosillo-Gomez, head of the programme for the country, is "to modify [the poor's] relationship with health services" so that they take part in maintaining their health and well-being. Another important component, says Sergio Vasquez, who oversees Oportunidades in Querétaro state, is the focus on women. Though considered head of the household under Oportunidades, the woman often neglects her own health, nutrition and education so the programme supports her in these areas so that she can, in turn, support her family. Oportunidades attributes its success to an incremental approach  the programme was expanded gradually, bringing in municipalities with fewer than 50 000 inhabitants during 2001, cities of up to one million population during 2002, and then in 2004 implementing the programme in metropolitan areas of one million inhabitants or more, including the nation's 22-million-population capital, Mexico City. The Huimilpan clinic is a typical example of how the programme works. The clinic serves four communities. Outlying towns are visited once a week on an appointed day. For emergencies, people come to Huimilpan. Rather than build new facilities, Oportunidades adds staff to existing clinics. Romero lives in a small room at the clinic. She shares her tiny kitchen with the files of the 417 families served by the clinic. Two weekends a month she goes home. Her year there is part of a social service requirement to obtain her medical degree. The programme aims to provide support so that poor people's lives don't unravel when hit by illness. The idea is that participants will be better candidates for jobs when there is work. Keeping children in school and teaching people how to take responsibility for their own development are also central to the programme. Oportunidades introduces the concept of "co-responsibility" to people who rarely think of going to the doctor, or wait until it's too late. Why do people wait so long before going to the doctor? One reason is that previously people had to pay fees or co-payments for health services, and the amount could be really high in relation to their meagre incomes, resulting in "financial catastrophe" for individuals and households. Such high expenditures are especially damaging when a family member's health has really deteriorated and often lead to households cutting down on other necessities, such as food or their children's education. This is a common situation around the world. WHO estimates that every year more than 150 million people  in 44 million households  face financial catastrophe as a direct result of having to pay for health services. Instead of waiting for acute situations to develop, families participating in Oportunidades can go for regular check-ups and are starting to see the difference. A 2004 study by Mexico's National Institute of Public Health found that the number of regular check-ups among Oportunidades families increased by 35% in rural areas and 20% in urban areas. According to the Oportunidades/Progresa programme, the number of sick days for children aged under five years and people aged 1649 years fell by 20% in the municipalities incorporated in 1998 and 2000. "We don't get sick as we did before," says Maria de la Luz, one of Oportunidades' beneficiaries. "We almost never get sick." To be allowed to participate in the programme, heads of households must come to regular consultations with their children and for themselves, and they must attend the monthly lectures. Since starting, Oportunidades has added services for people aged over 60 years, who find it harder to find work and who are more vulnerable to ill-health. Before the Oportunidades/Progresa programme began in 1997, 18.6% of Mexican households were classified as living in extreme poverty, according to Mexican government data. In 2002, this figure was 15.8%. In Mexico's poorest state, Chiapas, 70% of the population are beneficiaries of Oportunidades; the proportion in Oaxaca is 61.2% and in Guerrero 51.3%. The IADB found similar results in an evaluation last year. The results in Mexico and other countries have drawn widespread praise for CCT programmes. Nancy Birdsall, President of the Center for Global Development, described them as one of the most significant innovations in promoting social development in recent years. "I think these programs are as close as you can come to a magic bullet in development," Birdsall told the New York Times in January 2004. This is because CCT programmes can improve the efficiency of social programmes and increase equity at the same time. Yet the programme isn't without its flaws. Hermosillo-Gomez admits that Oportunidades' biggest problem is overcrowding of clinics during consultation hours, when they're packed with patients waiting to see the doctor. And Romero would like to see a small payment requirement for services and medicines which are currently available, to encourage people to value them more. Vasquez says that rotating doctors on a yearly basis is bad for continuity. Nevertheless, politicians of all stripes have signed up to the programme. While the 2 July election results have been contested and a decision on whether to order a recount of votes will not come until September, what is certain is that both Felipe Calderón, the candidate of the ruling National Action Party who won the election by a slim majority, and Andrés Manuel López Obrador of the left-leaning Party of the Democratic Revolution, have pledged to continue Oportunidades.